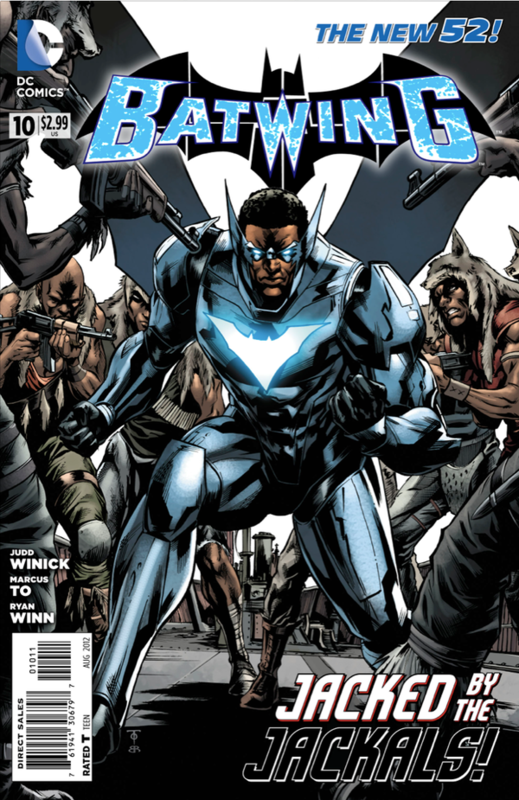 BATWING fights pirates known as THE JACKALS as they attempt to smuggle a mysterious cargo. BATMAN’S investigation leads him to China to face an unexpected member of his ROGUES GALLERY! Batwing locates some African pirates and finds their “cargo” right before the ship explodes. Batwing contacts batman in Gotham to identify the “cargo”, a Chinese scientist. At the estate of the Nigerian prime minister there is a family gathering which is interrupted by a suicide bomber. 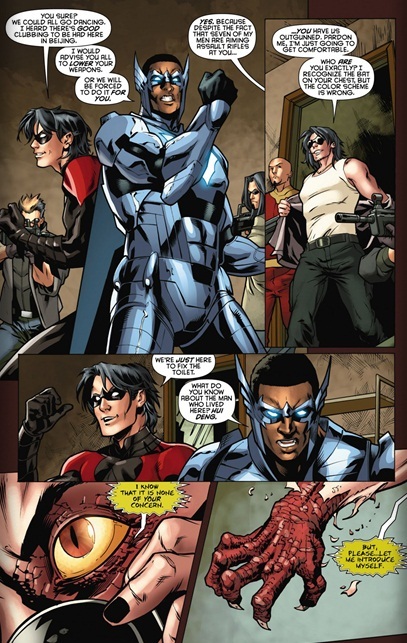 In Beijing Batwing and Nightwing check the office of the lost scientist and get attacked by a local gang their super powered leader Long/Dragon. In Gotham Penguin thinks everything is falling into place. Cover- Cool looking cover with Batwing in the center of the cover surrounded by the pirates called “The Jackals”. 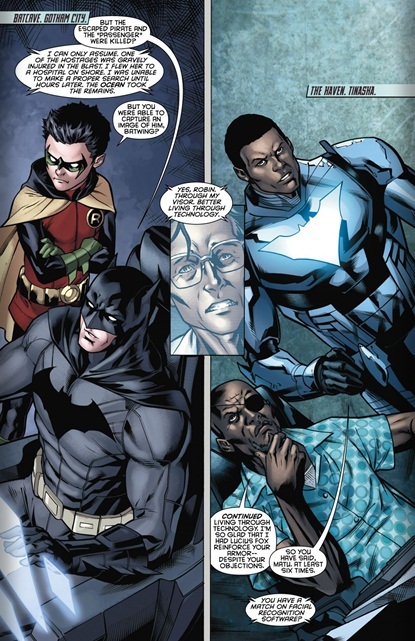 Parallel- I love the parallel between Matu Ba & Batwing and Batman & Alfred. Both Batwing and Batman were orphans who found surrogate fathers to hone their skills and guide them along the right path. No one knows Batman as much as Alfred, just as no one knows more of Batwing besides Matu Ba. It’s a parallel that makes this issue all the more engaging. Art-Marcus To is on art details and thankfully the book looks good. Judd Winick– Hats off the Judd honestly this book starting with a bang last year and while this issue and the one before felt allot less stellar how he has managed to assimilate Batwing into the Batman mythos. Taking him into Gotham for the conclusion of his opening arc, team up with Batwing then and now along with Alfred making upgrades to his armor…and now a connection between crime in the continent and the Penguin in Gotham? I’m impressed! Sign me up for the long haul Judd with you at the helm! Here’s to outliving the last bat title Azrael! Colors- While I’m sure it was intentional the color palette of this issue was decidedly drab. I’m not saying make it as bold and bright as Green Lantern New Guardians but a bit of saturation in the color department could really elevate the art to higher levels.